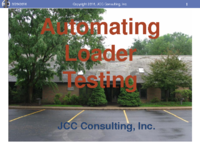 The JCC LogMiner Loader, developed at JCC, is used in wide range of mission critical applications and acts as the glue for diverse and complex architectures. We have had very few times when bugs have escaped our labs. That is because we subject all changes to aggressive testing that tortures the product with randomized configurations and sudden failures. It also tests a wide range of environments including multiple versions of the operating system, hardware architectures, companion products etc. In this presentation, we will discuss how we have achieved a rigorous level of testing. Having trouble getting this file to OpenVMS? Copyright 2013 - , JCC Consulting, Inc.